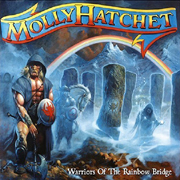 Molly Hatchet is a band name that most may know from a movie soundtrack or your older relative?s eight-track collection, yet this veritable workhorse still can crank out some no-nonsense Southern rock boogie. Their latest effort, a 12-track collection loosely based on the memory of guitarist Bobby Ingram?s wife, is a solid array of straight ahead swamp rock and down home Southern rock fried just to your liking. With a swing in its step and that unmistakable Southern rock charm firmly at hand, songs like "I?m Ready For You", "Behind the Bedroom Door", and "Time Keeps Slipping Away" sound just as huge as any of the group?s hits from the days of yore. Grab your Rebel flag, a six-pack of brew, and rock the night away at the roadhouse with Molly Hatchet?s rousing comeback.